Wind turbines are roaring into British Columbia's vast and rugged Peace River region, and unlike some areas of Canada they're generating little protest from the local communities. Wind turbines are roaring into British Columbia’s vast and rugged Peace River region, and unlike some regions of Canada, they're generating little protest from local communities. "The Peace," as it’s known in the province, is where B.C.’s first industrial-scale wind farm started up in 2009. A second major field of turbines started generating power in February this year, and a third is under construction. In some places, wind projects have run into opposition from people who say they endanger wildlife, or who fear adverse health effects from the noise and vibration of the turbines. And yet hard words for these noise-making, scenery-altering industrial behemoths are hard to come by in The Peace. Locals and energy developers alike credit acceptance of wind power largely to the region’s pragmatic, entrepreneurial attitude, and its intimate familiarity with energy development. Wind looks like a relatively low-impact source of energy, they say, in the context of a region that sports western Canada’s most powerful hydroelectric station, coal strip mines, and rampant oil and gas drilling. In fact, pull from grass-roots community activists inspired the row of 78-metre-tall wind turbines that have been generating power for a year and a half near Dawson Creek, the Peace district’s commercial and cultural hub. 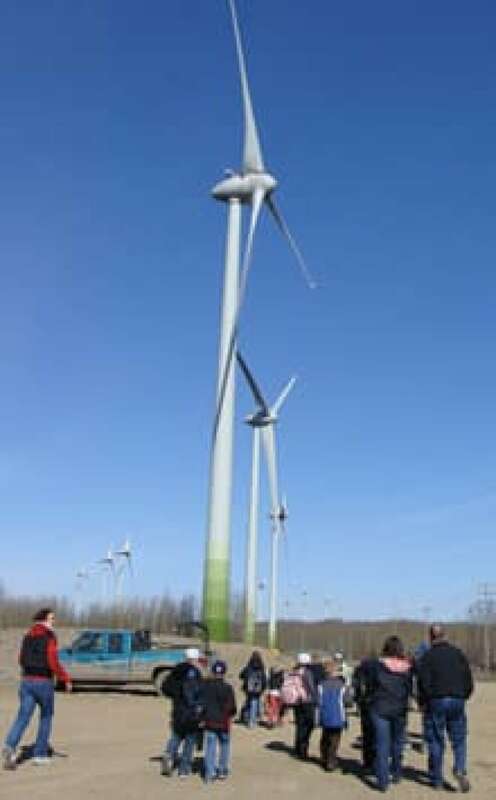 The 34-turbine project was initiated in 2003 and backed all the way by the Peace Energy Cooperative, a group of Dawson Creek residents keen on renewable energy. It was the cooperative that zeroed in on Bear Mountain, a local hiking spot within view of town, as the right location for industrial-scale wind power. Photographer Donald Pettit, a founding member of the cooperative and author of Powershift: The Hope and Drama of Monumental Windpower, says neighbour-to-neighbour outreach on the what and wherefore of wind power overcame opposition from a handful of opponents, including several landowners adjacent to the site. "We had hundreds of local members keen on renewable energy and wanting to see this happen. We were ahead of the game, and we were a broad-based grassroots organization running the show." The Peace Energy Cooperative ultimately handed implementation of Bear Mountain to Victoria energy developer Aeolis Wind Power, which raised the capital and erected the turbines. It is private developers such as Aeolis that are pushing follow-on wind projects in the Peace, but local residents, First Nations and municipal councils also have much to gain. Building wind farms provides hundreds of spinoff jobs, according to Colleen Brown, who relocated from Victoria two years ago to open a regional office for Aeolis in Fort St. John, about a 75-kilometre drive northwest from Dawson Creek. She says there’s plenty of business for local suppliers if they have the trucks, gravel and other goods a wind developer needs to lay roads and foundations. "They’ll be in nonstop demand," Brown says. 29 – Number of wind farms with a capacity of at least 50 MW in operation across Canada as of 2011. 79 – Projected number of farms with a capacity of at least 50 MW to be running by 2020. But Brown denies that wind farms are only about economic development in isolated communities. She senses an uncommon awareness among Peace residents of society’s reliance on energy — a consciousness that, she says, translates into greater acceptance of wind developments. "There isn’t the same sense of entitlement you find elsewhere," says Brown. "They don’t think [power generation] has to be shoved over into somebody else’s backyard." Those messages resonate in Tumbler Ridge, a remote town 85 kilometres southwest of Dawson Creek. It is surrounded by proposals for wind power development, and is already home to the 79-turbine Quality Wind project that broke ground this winter. Wind power represents economic diversity for Tumbler Ridge. The B.C. government created the town from scratch three decades ago to stimulate coal mining operations nearby, and Tumbler Ridge has since boomed and busted along with the market for coal. Coal demand is strong today, and despite population growth since the 2006 census (which pegged the town at 2,454 residents), it's still estimated to be at least a third smaller than its 1991 peak. According to Michele Schalekamp, chief financial officer for the District of Tumbler Ridge, aging infrastructure built all-in-a-go now threatens to fail just as dramatically, pushing the district into debt. That makes the estimated $1-million annual take in property taxes anticipated from the Quality Wind project a significant addition to the town’s $7.8-million tax base, says Schalekamp. Wind projects also benefit residents directly through the prospect of jobs and, if the community grows, boosted property values. "So there’s not a lot of squawking going on," quips local back-country guide Aaron Fredlund when asked if there is opposition in town to wind power. Fredlund himself could be excused for opposing wind projects, and yet he doesn’t. Fredlund knows the massive machines doing the construction work and the wind turbines themselves will clash with the wilderness mystique that attracts his hunting and horseback-riding clientele, and like other guides in the region he hopes to be compensated in some way for the impact on his business. But he’s not about to stand in wind power’s way. "I’m not small-minded enough to think that they should be stopped just because of me," says Fredlund. "If it provides power to thousands of homes, that’s great." 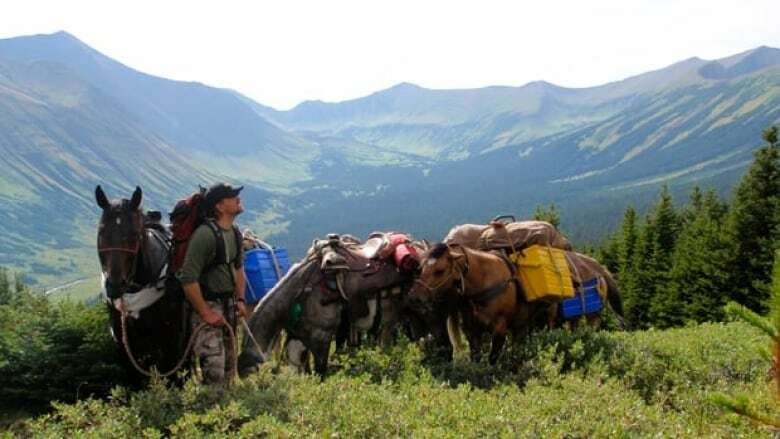 This attitude from someone who depends on the region's natural beauty may seem surprising, but the B.C. 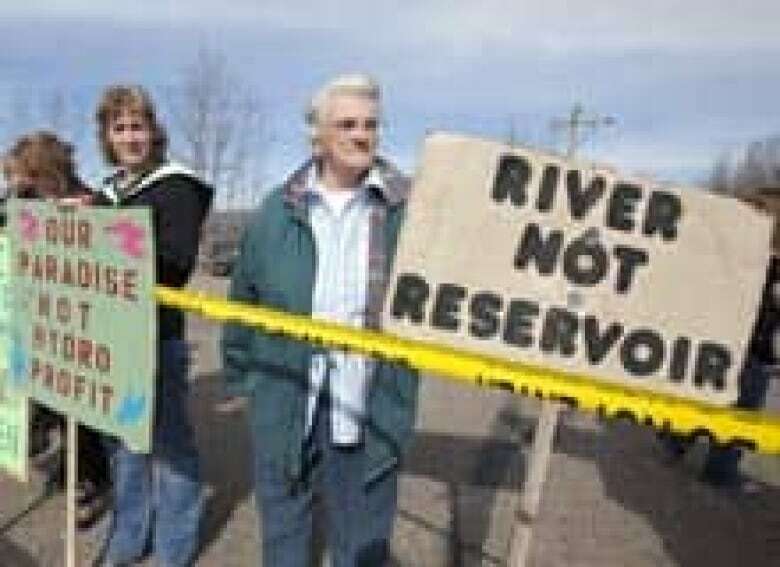 government may have done wind developers a favour by proposing a third hydroelectric dam on the Peace River. B.C. Hydro’s Site C project would submerge 83 kilometres of the river — small only in comparison to the W.A.C. Bennett Dam, which in 1968 turned a 251 km stretch of the Peace River into B.C.’s largest lake. Site C has — in stark contrast to wind developments — polarized communities in the Peace. Fredlund says there is really no comparison between the two energy options. Dam the Peace again and another productive valley will be altered forever, whereas wind turbines get dismantled at the end of their useful lives — or earlier if unanticipated impacts emerge. As Fredlund puts it: "Take them down, plant some trees and you wouldn’t even know that they were there."